Spring in the South can be hot. We were a little concerned when the temps started climbing a week before our Regional in N. Georgia. Trialing is fun- less so when the temps are in the 80’s! But, we needn't have worried, the rain showed up followed by a tremendous cold front and morning temps in the 20’s! The sun was bright and the breeze was perfect under clear skies for the entire three days of the trial. Friday, we ran a normal trial. That enabled us to get acquainted with the fields (more so for the dogs, since many had never been on these fields). The points, of course, and the placements did not count towards the upcoming Regional Saturday and Sunday, but carried forward to next year. A Field placements were: 1. Randy Schultz/Cap, 2.Keith Howard/Frank, 3.Randy Schultz/Ruby, and 4.Ken Buck/Chance. B Field placements were: 1. Jeff Keck/Trim, 2. Brandon Pritchett/Taz, 3.Randy Schultz/Cap, and 4. Randy Schultz/Ruby. (Randy had a good day!) Judges J.W. Collins, Brad Mitchell, Bodie Ray and Walt Sanderson, Bird Planter Casey Roberts and Field Marshal Stan Perdue kept us on the straight and narrow. Going in to Saturday morning, the dogs were ready and the handlers were nervous. The fields were huge and both had cutouts, ponds, tree lines and fingers extending in to the woods. 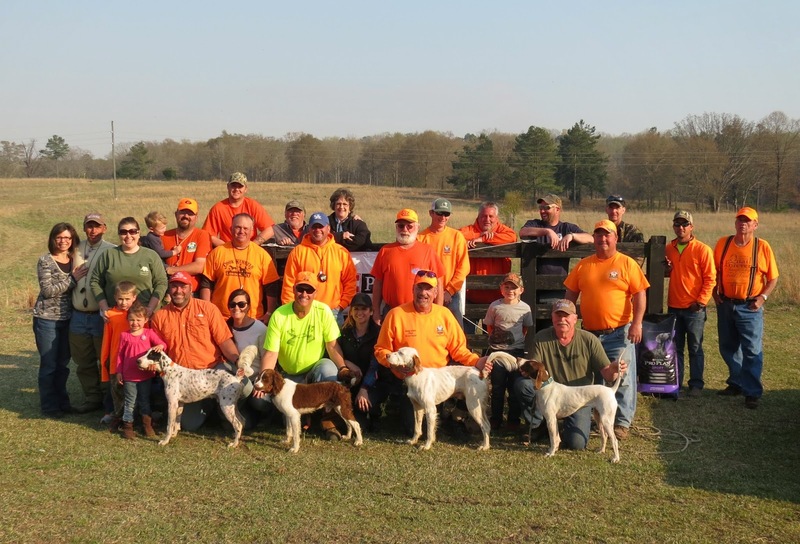 36 dogs qualified for the Regional this year and we elected to run 18 braces Saturday with a cut to 16 dogs carried forward to Sunday. At the end of Saturday, Keith Howard and Frank were First, Mitch Hurst and Ace- Second, Bill Green and Brennen Green and Toothpick -Third, and Bobby Wheat and Smoke -Fourth. Saturday night we held our region banquet in the 4-Star Plantation clubhouse. After a dinner of “steak the way you like it” and all the fixings, we got down to some serious business with our elections and awards. Apparently, we found some suckers…..er, volunteers, to run for President and the other officers. Ballots were counted and the new Georgia Region Officers are: President Gene Pritchett, Vice President Jeff Keck, and Treasurer Brenda Keck. The two elected Directors-at- Large are David Healan and Bodie Ray. The Awards for the last season were handed out by Brenda Keck, as Mistress of Ceremonies. The Rookie of the Year went to Gerald Pannell. Gerald stepped in and took over our website and has a fine dog to compete with, as well. The Most Improved Dog Award went to Flatland’s Sir Brennan (Toothpick) owned by Brennan Green and handled by his father, Bill Green. This pointer is a force on the move! Sportsman of the Year was awarded to Dan Miles. His little Brit, Ty, kept us all looking over our shoulders. Dan is a new guy who’s made a big impact with us. Whether he comes off the field with 5 or 0, he’s happy to be there and is always ready to lend a helping hand. The Judge of the Year went to Stan Perdue. An eagle eye and a sharp pencil kept us all in line! The Scott Clark Award for all-round super attitude was awarded to Gary Garrett for his work at his grounds and striving to make his place a National Class venue in Ball Ground, GA. The first-ever Service Award went to Angela Healan for her 20+ years of handling the checkbook and statistics of the Region! No small feat and she did it consistently well! High Point Dog was awarded to Jeff Keck and Trim. Despite sickness and injury and an inability to make every trial, Jeff and Trim managed to surge to the lead in the last trial of the season! High Point Female went to Randy Schultz and Ruby, who took it home the last trial weekend, as well. Sunday morning the temp was 26 degrees. Camper heaters were running and it really felt like a day to trial! Judges J.W. Collins and Brad Mitchell took us through the entire day. Their calls were fair, consistent and non-partial. And, I’m here to tell you they used the entire scoring scale….just sayin’. It was a pleasure to have them down to judge us. Field Marshals Bodie Ray and Stan Perdue kept the trial moving. They handled a tie for 4th and 5th place, extra birds and 15 min braces, late handlers, back to back runs and all the other minutiae involved in a Region Trial. And, they did it in fine fashion! Casey Roberts continued to outfox us with his bird planting skills and we appreciate his dedication. Two more cuts later, the Final Hour competitors were Jeff Keck and Trim (Setter/Male) and Randy Schultz and Cap (Brit/Male). They released at the line, and for an hour the gallery had no idea who was ahead, behind or more tired! Randy didn’t want to waste time heading for the cutout and jumped the 4-board fence, twice. Jeff and Trim worked like it was a day in the park, methodically and with class. (Jeff did not give the old man any slack, whereupon Randy called AARP and appealed for help and an ATV- denied!) 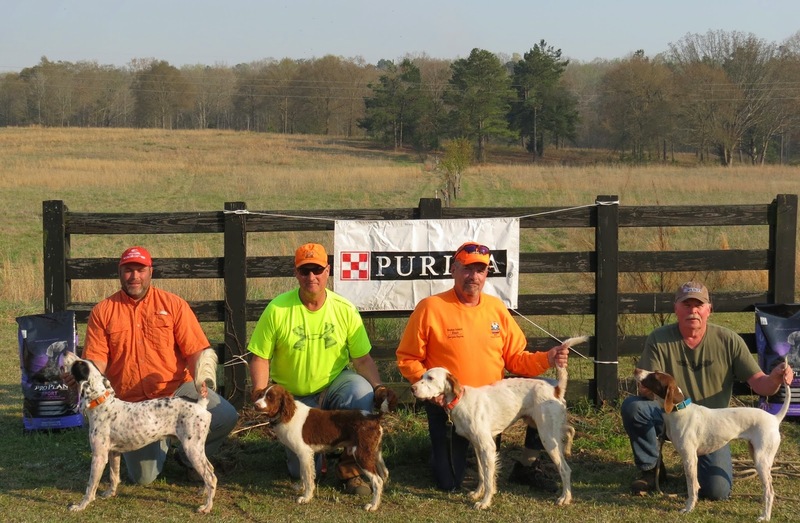 At the end, Jeff and Trim came off the field victorious and not only captured the Georgia Region High Point Dog Award the previous night, but the #1 Dog in Georgia that day! 2nd was Randy Schultz and Cap, 3rd Gary Drinnen and Ziggy, 4th was Jeff Welker and Aunt B (to the tune of the Andy Griffith Show), 5th was Keith Howard and Frank, 6th was Randy Schultz and Ruby. 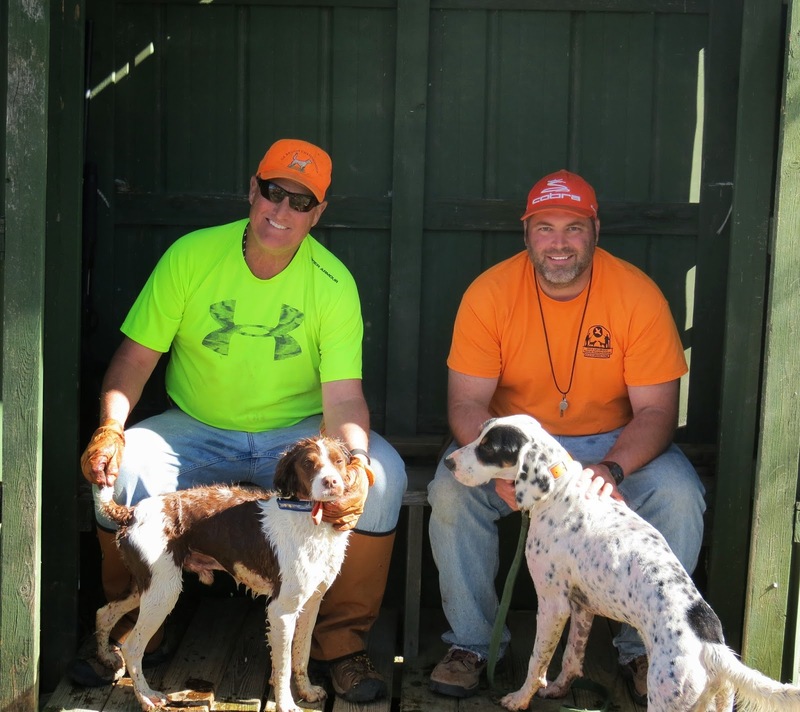 Congratulations to Jeff Keck and his fine setter, Trim! 2015 Georgia Region Champions! See you in the blind!